Patrick and I will meet at 9 am Sunday at Riley's Lock on the towpath in MoCo. Runs in the 9 to 16 range can be easily accommodated; if you want to run 24, I would advise getting in 8 beforehand. The route we do is mostly natural surface (towpath, dirt roads) plus a road section. Directions are on the Where We Run page. Let us know if you plan to join. 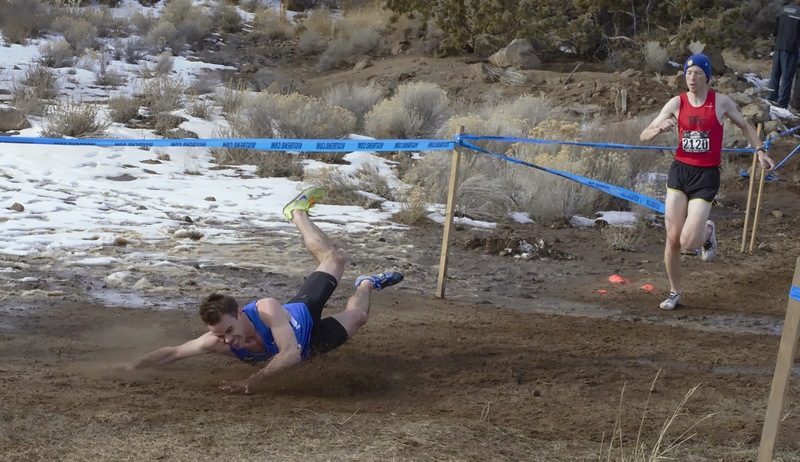 Describing the course as “just absurdly difficult, the most difficult I've ever seen,” Georgetown Running Club (GRC) Head Coach Jerry Alexander had some trepidation as his men’s team lined up at the National Club Cross Country Championships last Saturday in Bend, Oregon. Alexander had no doubt in athletes’ ability to run well – the veteran coach had confidence in the fitness and talent of his top men and the addition of several elite standouts to the team in the past year bolstered his faith in their potential. 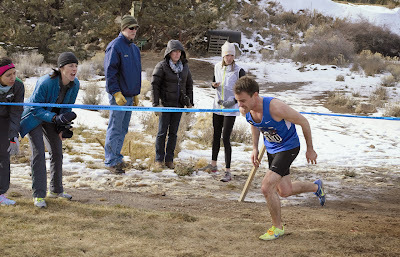 But Alexander knew that the unpredictability of running at altitude (Bend is at 3,600 feet) and the strong field of elite competitors made his goal of finishing in the top 10 seem like a long shot. Despite these challenges, the GRC men outperformed all expectations, finishing 9th overall in the team competition over the 10,000 meter course. Led by Kieran O’Connor (46th place overall, 32:36), with GRC teammates Mike Franklin (61st, 32:49), Luke Meyer (72nd, 33:05), Kevin McNabb (75th, 33:08) and Sam Luff (105th, 33:39) rounding out the top five scores, the team bested a number of other elite teams, including the Boulder Track Club and the Boston Athletic Association. 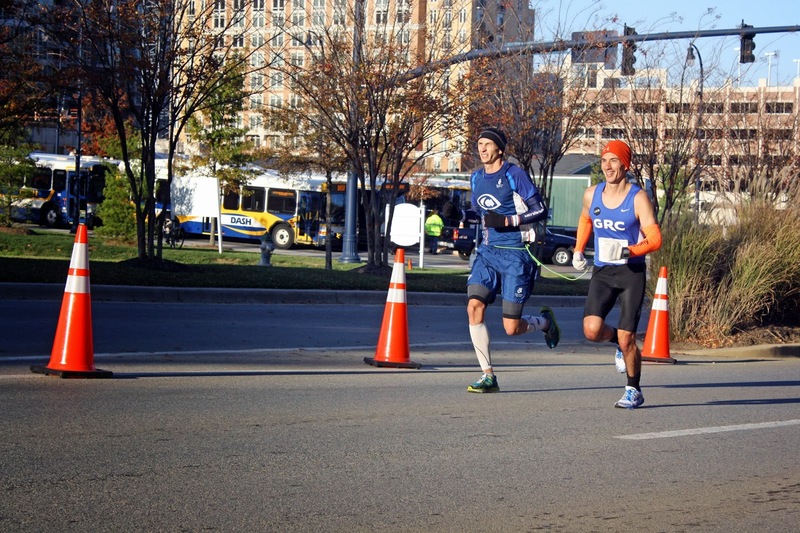 Also competing for GRC on Saturday were Paul Balmer (118th, 33:59), Paul Guevara (160th, 34:27), and Sean Barrett (214th, 35:19). Now that GRC met its goal of cracking the top 10 at Club Nats, the bar has been raised for next year, when the meet will be close to home at Lehigh University in Bethlehem, Pennsylvania. For 2014, Alexander’s goal is for both the men's and women's teams to finish in the top five. With the team’s talent, depth, and experience, and under Coach Alexander’s guidance, this should be an achievable feat. Charlie Ban's secret marathon mission - Operation Wild Pitch - is officially declassified. 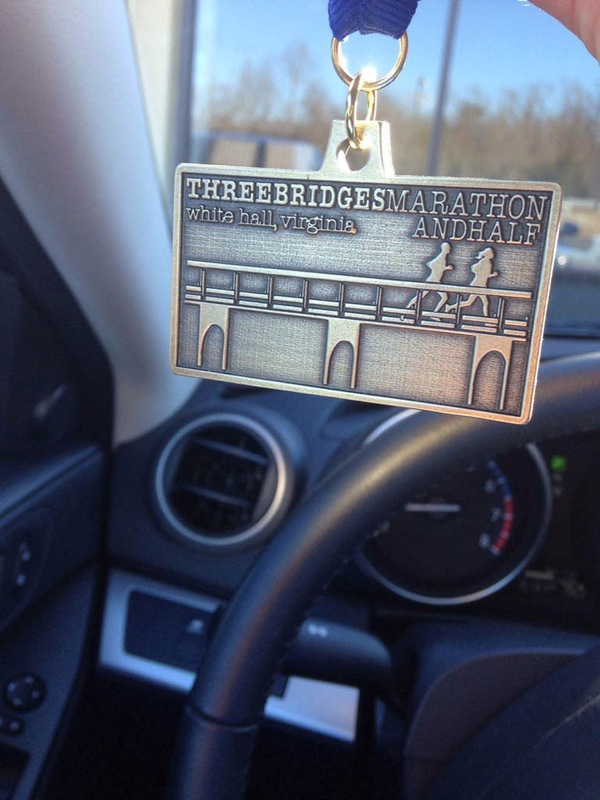 He won the Three Bridges Marathon this morning in Charlottesville in 2:36:04 on a hilly course. He opened with a 6:03 and basically ran miles between 5:33 and 6:10 the rest of the way. Dave Hryvniak led early; Charlie caught him around 9 and he later dropped out. This race was actually supposed to be held a week earlier but was postponed for weather reasons. Charlie, I believe, decided to run it on Tuesday-ish. He won this medal and, like everyone else, a cup of turkey soup. FLASH! GRC MEN FINISH 9TH AT CLUBS!!! After 6 tries, the Georgetown Running Club Mens Cross Country Team brings home a top ten finish at the USATF Club Cross Country National Championships! GRC beats Club Northwest by a single point. Coach Jerry: what a day! I cannot tell you how pleased, and how proud of the guys I am. I wish you were all here to share it with us....we beat Boulder Running, Austin Team Rogue, and BAA, all of which are legit pro teams, so it was a great performance. kieran was a beast out there, and the fact that he caught Kwiatkowski in the last 800 was outstanding. mike ran strong, luke hung on tough, kevin ran perfect tactics (moving up the whole way) and sam hung on tough even though he fell on the last lap. kevin tore his feet up in spikes that didn't fit properly and had to get medical attention. Luff hits the dirt (or the mud)! 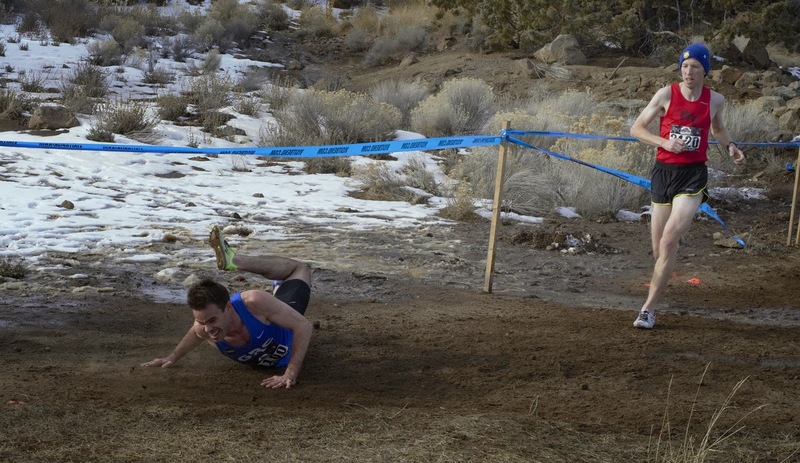 "I captured a runner in the elite men's open race biting the dirt on one of the steepest hills of the course at the USATF Club XC Championships in Bend OR. The course was really tough and treacherous. 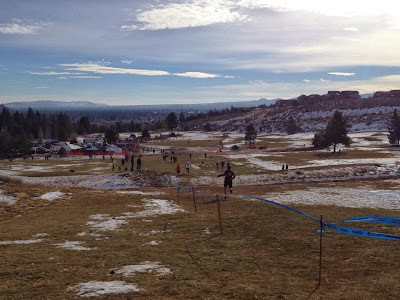 The guys in the men's open race were flying down this hill. I got lucky and captured this guy right when he hit the ground. He was able to pop up and keep going". Kieran first GRC man in 50th or so. Mike, Luke, Kevin in the top 80, Sam a few places back from 100th. The GRC top 6 beats German Fernandez! 8k in, Kieran and mike right around 50. Luke, Kev and Sam close behind. Mike just outside the top 50. Needs top 36 for a guaranteed ride home from the airport. 1 loop in we have Mike F, Kieran and Luke in about 80th, with Sam and Paul B a few seconds back. Good spread and they look smooth. GRC well positioned in the top 100 a half mile in. GRC Ready to Race in Bend! 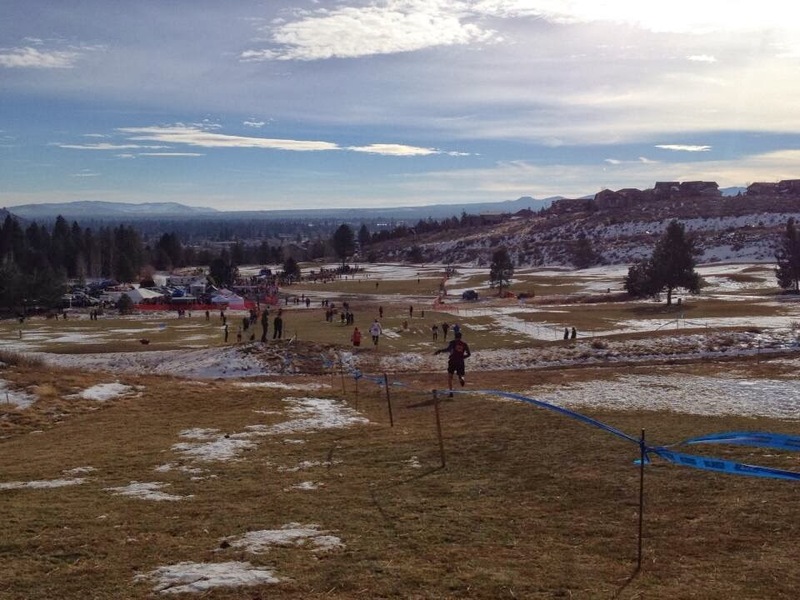 REPORT: Bend's cross country course was described late tonight as a "bleeping bloodbath" by a member of the GRC. 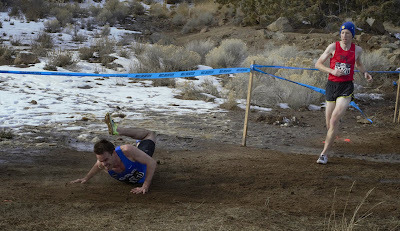 "The course is (expletive) crazy," said the anonymous GRCer, "crazy hills, challenging terrain, mud, et cetera." He added that yesterday the course had to be "snow-blown clean." Asked whether this bodes well for the GRC, the teammember said "it's a total wild card." RELATED: some on the team noticed the altitude. On Saturday, the men of the Georgetown Running Club will lace up its spikes and attack the grass at the 2013 USATF National Club Cross Country Championships at the River’s Edge Golf Course in Bend, Oregon. Luke Meyer is a very accomplished cross country runner - an All-American at Yale - and was 7th at Clubs in 2009. 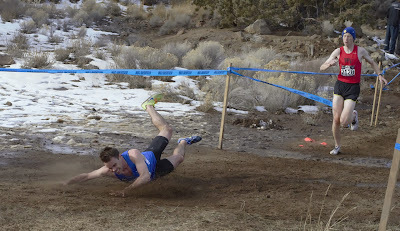 Sean Barrett is a very strong runner and ran a fantastic race at World Military Cross Country Championships in Serbia this past March. “The worse the conditions, the better Sean likes it, so he could be up front for us as well,” Coach Alexander explained. Sam Luff is back to full fitness, and is always a threat to be our top man in any competition. 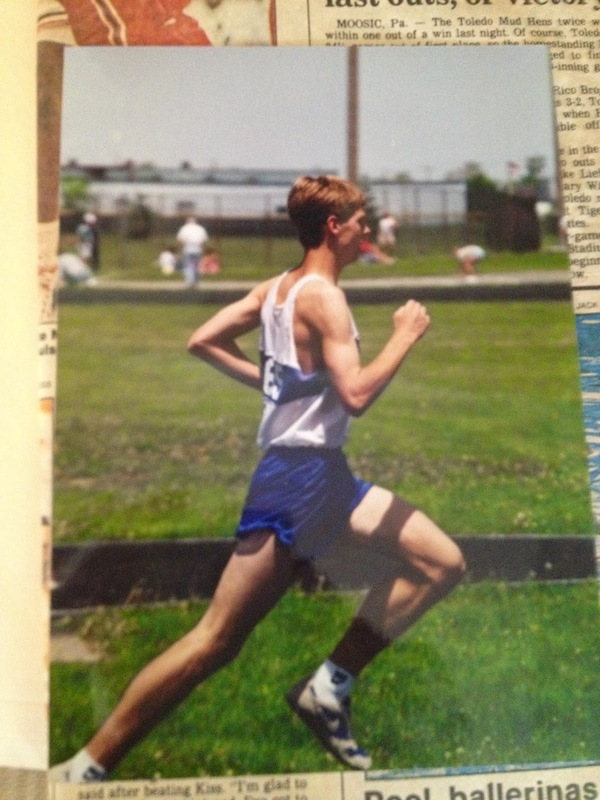 Kevin McNab was a very good cross runner at Texas A&M, and has broken 30 on a hard course. “He could certainly pop a big race at Bend,” Alexander said. 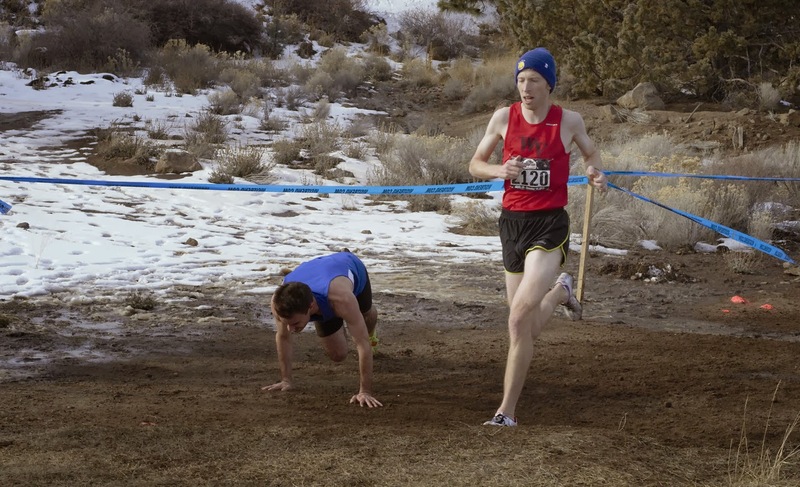 The wild card in the group is Kieran O’Connor, who has not run a cross country race since high school! 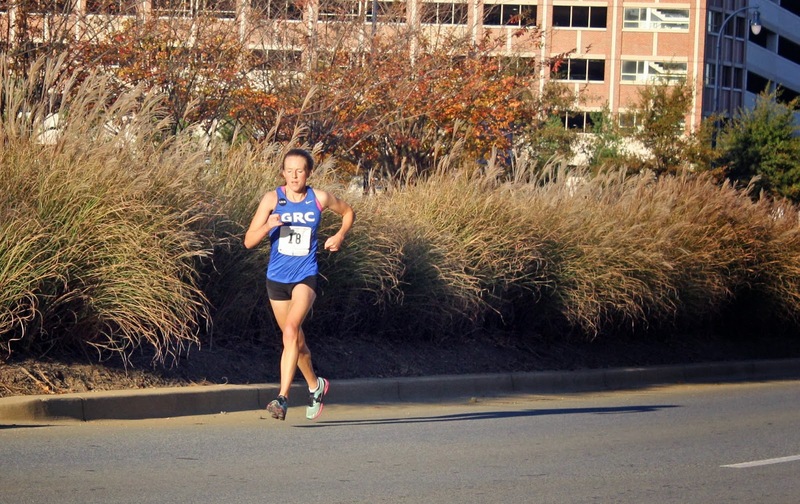 O’Connor did, however, run a fantastic race at Wilson Bridge Half Marathon (in which he broke 1:07) and has been setting personal bests all season. 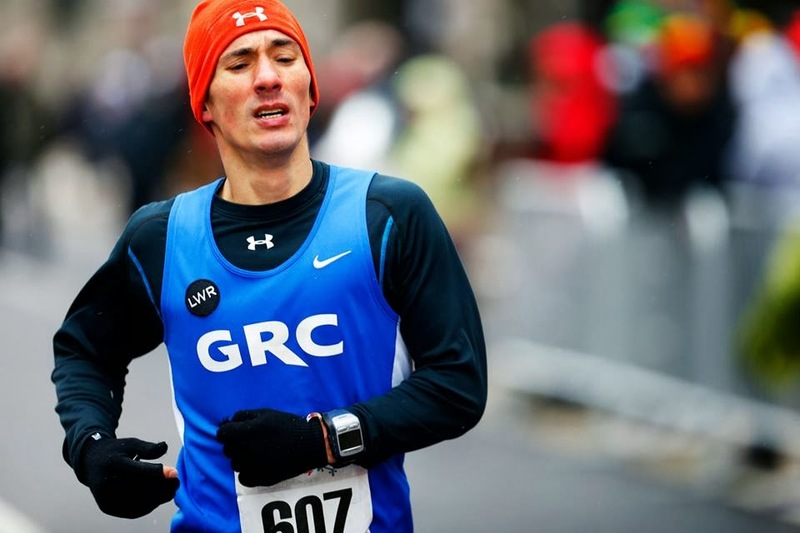 The GRC also got quality depth from Paul Balmer, who is returning to his home state and will have the support of family friends at the course, Tex Paul, who is an experienced cross runner and Matt Hassett, who continues to make great improvement every season. 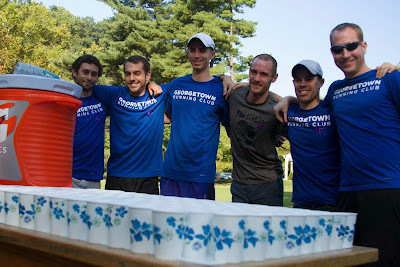 Although all of the above 9 harriers will be racing, only the top 5 finishers from the Georgetown Running Club will score. However, simply getting to the starting line will be a feat within itself for the GRC. The team will fly into Portland, Oregon on Thursday. Then, on Friday, they’ll ride two mini vans three hours into the Oregon interior and review the race course. On Saturday, the team will race and the next day begin the long arduous trip back home. In addition, the race is at altitude and the conditions promise to be robust. “Our goal is to finish in the top 10, and despite what appears to be a deeper field than recent years, I think that goal is realistic,” Alexander said. Although Bend could receive rain on Thursday, the weather on Saturday calls for partly cloudy skies and a slight wind. The high is forecasted to be 40 degrees with a low of 25. The men’s race will start at 12:45pm Pacific (3:34pm Eastern). Race results will appear here and on GRC’s Facebook feed shortly thereafter. At our team gathering last December, a grieving teammate offered some comforting words. The pain we all felt in losing our dear teammate and friend would not always be so very acute; eventually, he said, we'd be able to look back on our time with Lauren with a smile and be grateful for the time we had together. As we approach the anniversary of her death with heavy hearts, let's do our best to think of Lauren and smile. We will always hold her close to our hearts and remember her for being a thoughtful friend, devoted teammate, and spirited competitor. The challenge, as time passes, will be to preserve the little memories of Lauren: the laughs we shared, the conversations we had, the things in everyday life that remind us of her. In that spirit, we are collecting and sharing memories of Lauren. Her teammates have posted a few memories below. Feel free to post more in the comments. It can be anything, no matter how seemingly random, silly, or simple. It will be there to remind us of the moments that made Lauren who she was, to preserve the memories that might otherwise slip away, and, above all, to allow us to collectively look back on our time with Lauren with a smile. - At clubs, she told us that she was having trouble figuring out what her parents wanted for Christmas because they were always together -- so she could never get one parent alone to ask what the other parent wanted. - I also liked how diligent she was and how she was so good about eating healthy and getting enough sleep. When we were in Lexington, Lindsay and I would stay up late watching house hunters and law and order SVU, but she would take her hearing aids out before 10 pm and fall asleep immediately -- she told us that the nice thing about needing hearing aids is that when you take them out, nothing can wake you up. - Lauren was passionate about food and eating as local/organic as possible. She went to the farmer’s market every weekend to get the best meat, fruit, and veggies for the week and always talked about the latest recipes she was making- I remember she was particularly excited about a thai peanut soup she made when it started getting colder. I admired her patience to make trickier, more time-intensive recipes, like the bread she baked every Sunday. She also had the best restaurant recommendations- I have had many a good meal, thanks to her! - She told me that, while her honeymoon was incredible, the best day of her life was her wedding day because she and Peter were surrounded by such an amazing group of family and friends. - I remember one rainy day before practice a group of us girls popped into BCC to use the restroom. The grumpy janitor started to yell at us from down the hall but Lauren charged bravely ahead and we all followed her into the bathroom. Later, when someone mentioned how mean and irrational the janitor had been, Lauren shrugged, laughed, and said since she wasn’t wearing her hearing aids that day she hadn’t even noticed him. - Lauren loved nothing more than a good book and a fire in the fireplace. She mentioned on several occasions that one of her favorite places in the world was in the library in her childhood home, in front of the fire, with a book. Last November, she and Peter spent the night at a bed and breakfast in Virginia (a wedding gift) and they spent hours Sunday morning in front of a fire, reading the NY Times. That, to Lauren, was perfection. - Lauren always used to cook on Sundays. She told me about how much food she would make for the week. It sounded incredible! I remember thinking I could never be that organized or have so much talent in the kitchen. - In one of Coach Jerry’s infamous tempo/long run workouts, I lead the second-to-last mile and she was on tap to lead the final mile. We came through on pace, but very tired. Still, Lauren took off like a shot and I struggled to maintain contact. When I glanced at my watch 200 meters into her lead, I noticed we were at least five seconds ahead of pace. It took another 150 meters to communicate to her to slow down. At this point, she put on the brakes so fast, that I struggled not to trip over her. We almost ended up in a heap in the infield. Both of us finished that workout on target. I think this demonstrates that she never, ever was fully aware of her own amazing running talent. Brian "Breezy" Young recorded a huge personal best this morning at the California International Marathon in Sacramento, CA. "I finished with nothing left in the tank just as Lauren (Woodall Roady) did at the USATF Cross Country Club Championships one year ago," Young said after the race while pointing to the memorial patch on his singlet. "I've been working with Brian for more than 4 years, and he has worked hard every single practice for that entire time, said GRC Coach Jerry Alexander. "This major breakthrough is well-earned, and I couldn't be happier for him." Beth, Brian's Irish twin, remarked: "We all thought Brian was crazy when he did a 20-miler at 6:10 pace in the weeks leading up to the marathon, but it turns out the hard training paid huge rewards." Wertz ran 25:39 for 8th place. 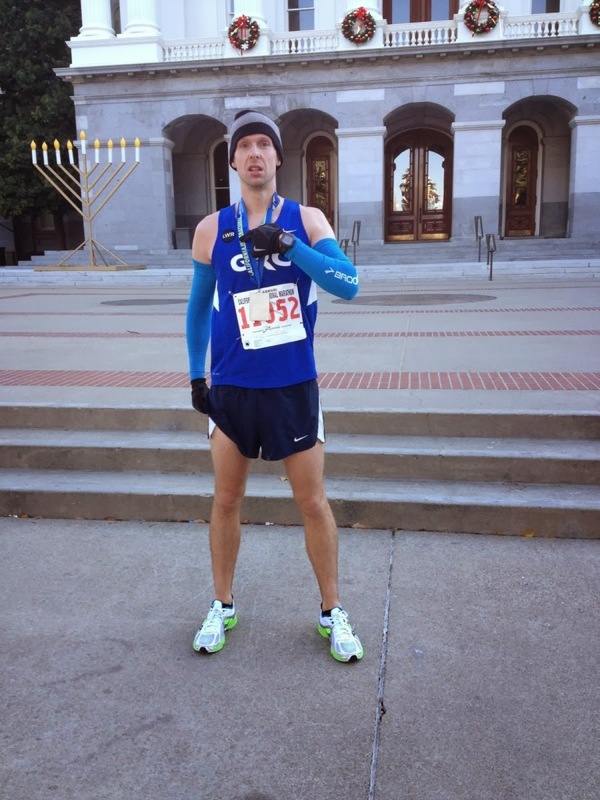 Brian Young aka Breezy is ready for a massive marathon pr in Sacramento tomorrow morning where he is lining up to run the California International Marathon. Breezy recently ran the Richmond half in November, where he managed to pr despite running through the eye of a squall. Breezy is no stranger to Old Testament-like weather patterns, having attempted marathons in the heat of Boston and the gale force winds of Green Bay. Conditions in Sacramento look favorable and Breezy is ready to take advantage of temperate weather and a net downhill course. Breezy is familiar with the west coast, where he spends a fair share of his day job prosecuting fraudsters, and is ready to throw the book at his previous marathon pr of 2:48:50 (2012) on the streets of Sacramento. Karl and Dix and I are meeting at 8. Want to join us? Jake Klim is a three-peat champion at the We Gather Together 5k in Sandwich, MA. Justin Snair placed 2nd in the Arlington, VA Turkey Trot with a time of 16:05. Julie Tarallo takes the W at the Tiger 5 Miler Turkey Trot in Easton, MA with a time of 31:15. 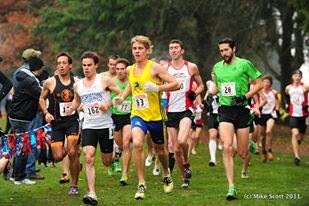 Chuck Kacsur placed 2nd in16:38 at his local 5k. Kerry Allen won the Tampa Bay Times Turkey Trot in Clearwater, FL in 17:58. MGP won the Moorestown cross country race in NJ in 19:40. Paul Balmer won the Zach's Place Turkey Trot in Woodstock, VT in 16:11. Sean Barrett won the San Antonio Road Runner's 4 Mile Turkey Trot in 19:35! 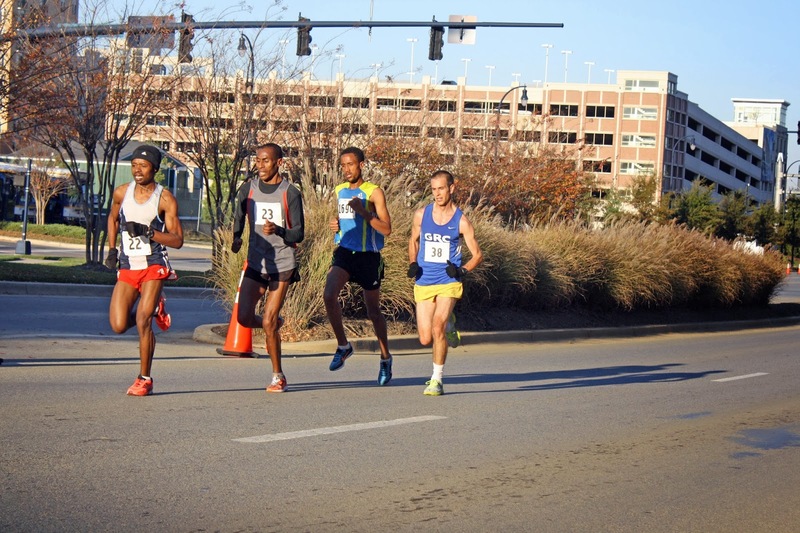 In Alexandria, Kevin McNab placed 4th on the Alexandria Turkey Trot with a time of 24:41. Sam Luff was 6th in 24:56. 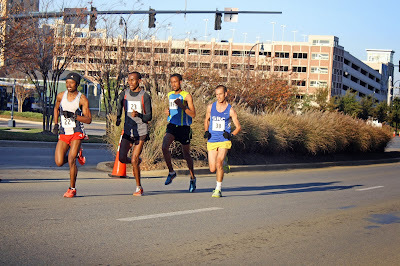 Tex Paul was 25:53, Dave Wertz was 25:59, Dave O was 26:48 and Charlie Ban ran 27:29. LDO was 4th in 29:18. Karl and I are meeting at Edward's Ferry @9am for 10-15 miles...most of which is on natural terrain. Comment if you're interested or if you want a ride there from North Bethesda. For anyone NOT running the XC workout tomorrow, Dangerous Dave and I are meeting at B-CC 8:00 am sharp for a tempo cut-down. May your wildest dreams come true. Luke Meyer continued to impress in his debut season with the GRC, leading the men at the inaugural .US National Road Racing Champs in Alexandria, VA.
Sam and I are meeting at the LB Johnson Memorial on the GW Parkway tomorrow at 6:35am. We will run south for 5.5 miles and see the team twice...then run back to our cars. We will add on as needed at TR Island after. Comment if you're interested. If you do show up, please be on time. GRC Sweeps at Run! Geek Run! 8k! Since it's inception in 2010, the Woodrow Wilson Bridge Half Marathon has served as the Visually Impaired Half Marathon Championships, where the blind sometimes lead the visually unimpaired athletes. The event offers a chance for competitive, visually impaired (VI) athletes to take center stage and earn coveted prize money. Over the past few years the Georgetown Running Club has put it's best foot forward to help make the VI Championships a success by volunteering as guides for the VI runners. This year was no different. GRC once again, stepped up to lend support. However, this time the club did not just find itself guiding competitors. Due to a last minute schedule change, the VI coordinator slot was empty less than a week before the championships. That is where I stepped in. I've been wanting get involved since I saw Dickson Mercer and Chicken Tender Runner (Andy Sovonick) lead their VI athletes to outstanding finishes in prior years. Being the (self-proclaimed) mid-distance runner that I am, I could not trust myself to guide these exceptional athletes the full 13.1. So the VI coordinator position offered a special opportunity to interact with the VI athletes during a majority of the race weekend, before and after the race. Duties involved assisting the athletes to the pre-race VIP dinner, an EARLY morning round up on race day and helping them back to the hotel after many ran their half-marathon PR's. This year we saw the VI course record go down as reigning champ, Aaron Scheidies, set a personal record with his guide, the ageless wonder, Dangerous Dave Wertz. Dave was THE guide of the day, leading Scheidies from Mt. Vernon to the finish at National Harbor. It was an exceptional feat considering the number of turns in the last two miles that required heavy communication from Dave, who had just ran over 10 miles at a (not so modest) 5:50 min/mile pace. When Dave volunteered to guide Aaron the fall, he planned this race schedule accordingly. With the, now infamous, government shutdown, Dangerous Dave was forced to make a decision between asking Aaron to find a replacement or drop his fall race plans and reschedule to make the VI championships. He made the right decision and raced into history with Scheidies. Next time you run into Dave, be sure to thank him for his unblemished record of selflessness. When all was said and done, I was glad to be a part of such a unique, fun and rewarding event. 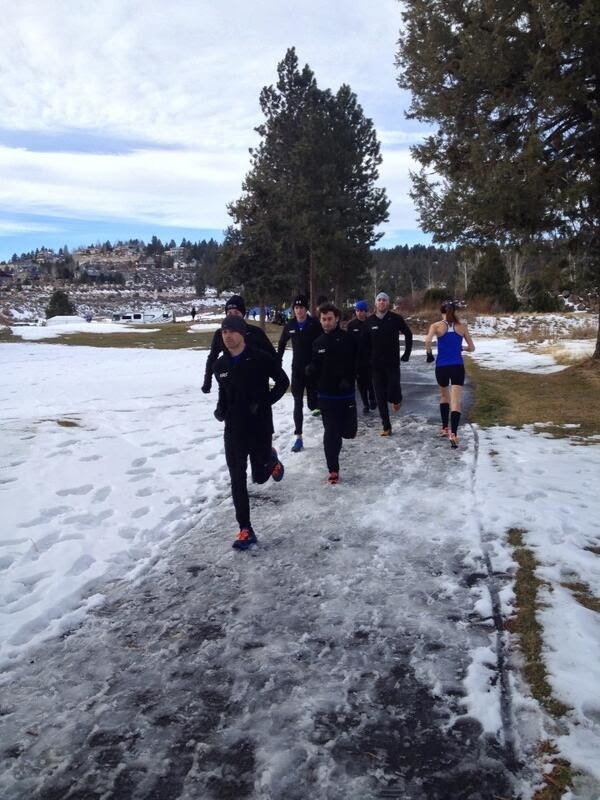 It is opportunities like this that help us realize the bond that ties runners together. Through running we are connected without bounds and without limits. At least now I know what I'll be doing during the 5th Annual Woodrow Wilson Half Marathon. One last thought; I'd like to send a big thank you out to all Veterans who have served and continue to serve our country. God bless you. Kieran's 1:06:51 is #2 on GRC Half Marathon Leader Board! UPDATE: Kieran O'Connor ran 1:06:51 at the Wilson Bridge Half Marathon this morning, which was good for 4th place (1st American). It was a huge personal best and a major breakthrough. The top American male was local sensation Kieran O’Connor of Washington, DC, who placed fourth overall and was the only non-Ethiopian in the top eight. The 26-year-old ran 1:06:56, earning $900. From the race's press release: "O’Connor was out of contention for the win early on, but stayed steady throughout the course and picked off stragglers. Meanwhile, ahead of him was Gebre, Gelaw and Mesfin, who was 12th in 2012 London Olympics 3000m steeplechase, 11th in 2011 World Championships and 19th in 2008 Beijing Olympics. 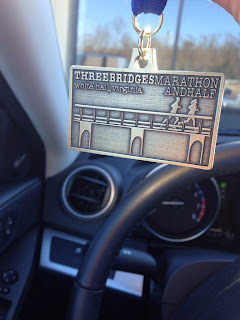 The trio passed through five miles in 24:33 and it virtually became a three-man race onto the Woodrow Wilson Bridge and into National Harbor before Gebre’s potent move." Lindsay O'Brien ran 1:18:53, a PR, and placed 7th (2nd American). Kerry Allen was 8th with a time of 1:23:56. Meanwhile, across the Potomac, on Hains Point, Paul Balmer continued his improvement and placed 2nd in the Veteran's Day 10k with a time of 31:55. JR Roberts was 5th in 33:30 while miler Tom Kelly placed 11th in 34:34. The Georgetown Running Club will compete in two signature races this weekend – The Wilson Bridge Half Marathon and the Veteran’s Day 10k. Kieran O'Connor, Lindsay O'Brien, and Kerry Allen will all be chasing half marathon personal bests at Wilson Bridge. "Kieran is ready for a major, major breakthrough," boasted Coach Jerry Alexander. "His PRs are not even close to reflective of his fitness level." In fact, Kieran has run numerous PRs in workouts this fall, often more than once in a night--and when the stars align for him on race day, which they have not so far, with the missed start at Navy 5 and the postponement of Wilson Bridge, he has the chance to make a serious statement. "Lindsay appears to have put her lingering injuries behind her," said Alexander, "and she's also fit to run a major PR." Alexander added, "Kerry is coming off a big PR at Army, and there's every reason to think she'll keep that train rolling on Sunday." Dave Wertz will be guiding Aaron Scheides, the visually impaired superstar who Dickson Mercer guided last year. Ryan Witters is the Visually Impaired Race Coordinator, which is a major position, and will require him to commit pretty much his entire weekend to the race. "I'm extremely proud of GRC's continued commitment to the visually impaired athletes who travel from across the country to compete at Wilson Bridge," said Alexander. "The GRC Board and I are always looking for ways the team can give back to the running community, and this is a perfect opportunity for us to do that. The elite visually impaired athletes like Aaron need someone fast enough to guide them, and we've got the athletes to do it, and the willingness to help." The lineup for the Veteran's Day 10k on flat, fast Hains Point is "Oregon" Paul Baumler, JR Roberts and Tom Kelly, plus Mary Grace Pellegrini and Elyse Shimada. Jake Klim is a "maybe". "I'm looking for Paul to make a statement at Vets Day, said Alexander. "Paul is trying to claim one of the uncommitted spots on the GRC A team at Clubs, and a strong performance on Sunday would go a long way for him in that effort." Tomorrow, on Saturday, Kevin McNabb and Heather Jellen will toe the line in the "Nearly Naked Mile." "Heather is out to defend her title. Her workouts have been strength-oriented, but she's got enough speed in her legs to run a fast mile," said Alexander. "Kevin has been laying low for a couple of weeks with a sore hamstring, but he'll be ready to roll on Saturday."